FIG introduces the FIG Peer Review Journal which includes a collection of all papers from FIG Congresses and Working Weeks that have passed the double blinded peer review process. 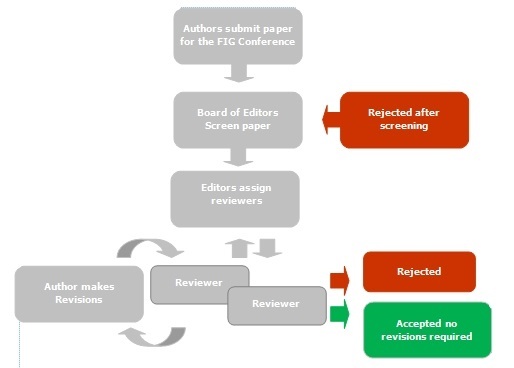 Since 2008 FIG has had a double blinded Peer Review Process for papers with an outstanding academic level or best practice for the FIG Congresses and Working Weeks. Now all these papers have been collected in a new FIG Peer Review Journal (ISSN No. 2412-916X). Future Peer Review Papers will be included in this journal. All papers in the Journal have gone through a thorough double blinded peer review process in which the blinded paper is being evaluated twice by at least 2 anonymous reviewers with a rating system that decides whether a paper can pass the review and how large changes and amendments are needed in order to finally accept a paper. Approximately 10 per cent of all presented papers at a FIG Conference are peer review papers. In average 50 - 60 per cent of the submitted papers pass the double blinded peer review process.